Jan. 15: Yesterday 30,000 Los Angeles public school teachers went out on strike. Today teachers will be picketing 1,000 schools in the second-largest school district in the U.S. With the slogan “On strike for our students,” their demands include more nurses, counselors and librarians, smaller class sizes. 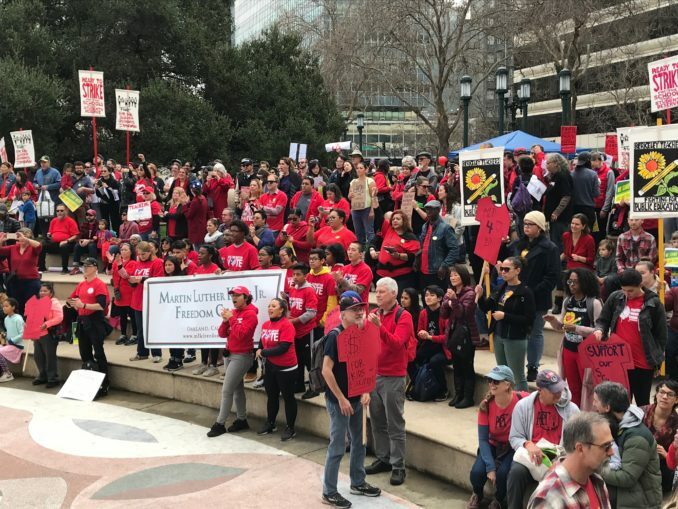 Jan. 12 — Today, the people’s protest site in downtown Oakland, Oscar Grant Plaza, was red with over 2,000 teachers, educators, students and community activists who came out to support public education. Activists wore red shirts, jackets and armbands to show support for California teachers who are fighting for a living wage and better working conditions. The East Bay Rally for Public Education drew the support of dozens of Bay Area unions and community organizations. 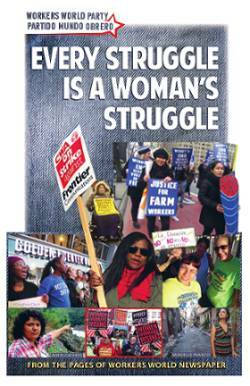 Bay Area teachers, students, parents, unions and community organizations rally Jan. 12 in support of growing militancy by California education workers. On Jan. 14, thousands of Los Angeles teachers, members of United Teachers of Los Angeles/California Teachers Association, will go on strike for a living wage, smaller class sizes, funding for public not charter schools and better school funding overall. The Oakland Education Association, the Oakland teachers’ union, is not far behind. On Jan. 11, Oakland teachers participated in school walk-ins to support L.A. teachers. Today’s rally highlighted the demands of L.A., Oakland and all public teachers who are coalescing in a national movement to fund and save public education. The streets of Oakland shook today with chants and songs as hundreds of OEA members, their families and supporters marched from Lake Merritt to the rally site. 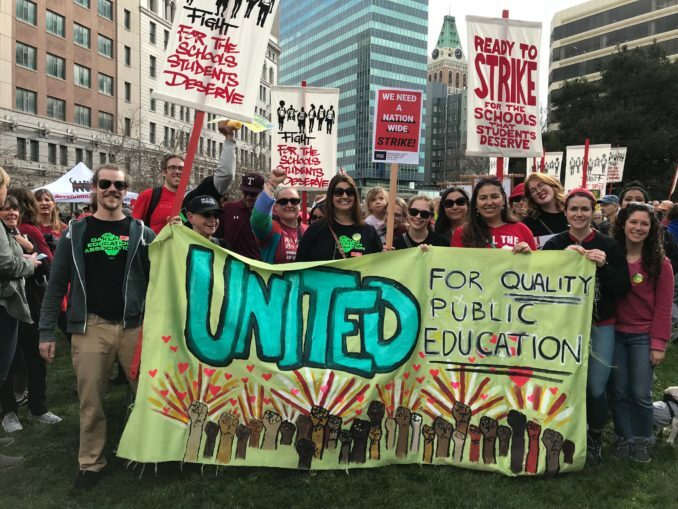 Hundreds of local unionists, students and the Bay Area progressive community came together there to demand an end to attacks on public education. Due to low wages and worsening conditions in Bay Area schools, there is a serious shortage of public school teachers. Many teachers at today’s demonstration talked about how impossible it is to survive in the Bay Area on their low salary. Teachers in both Los Angeles and Oakland are feeling the impact of the funding cuts on public education. At the same time, school districts are supporting and funding the opening of privatized charter schools. In December, the Oakland Unified School District announced plans to close or consolidate 24 public schools. Although the list of schools to be closed has not yet been made public, community members and OEA teachers have begun to mobilize to save their community schools. Over 150 students, teachers, parents and their supporters from Roots International Academy, a predominantly African-American public school, rallied inside the Jan. 9 Oakland School Board meeting demanding that their school be kept open. Roots families also attended today’s rally and spoke from the stage about the fight to save their school. The state’s failure to prioritize spending for public education, including real cost-of-living increases for teachers and support staff, is a catalyst behind the rapid radicalization of California’s teachers. Several high schools have already organized day-long sick-outs to put pressure on the school board to bargain in good faith. Although the Bay Area is one of the most expensive areas to live in, the school board has refused to offer a cost-of-living increase or to consider a reasonable reduction in class size. Teachers all over the country will be watching the Jan. 14 Los Angeles strike by the second largest teachers’ union in the country. OEA believes that it too will be on strike in the near future. Teachers say the future of public education is at stake. Greenspan is an Oakland public school teacher and a member of the Oakland Education Association.